I found an audio circuit and I built it just fine, but I find it a bit too quiet. How do I amplify the output so that it is a bit louder? I built it and loaded a sound clip. Everything works fine, but I found it a bit too quiet and I want to amplify it, but not entirely sure how. The biggest problem is that I do not have access to an oscilloscope so while this does play sound clips just fine, I have zero idea what the waveform output looks like at the speaker, or even its voltage level (I'm assuming the peak to peak voltage is less than 3.7V) and because of that, I'm not sure how to amplify the output to make it more audible. Or is this even possible to amplify it due to the 3.7V constrain? 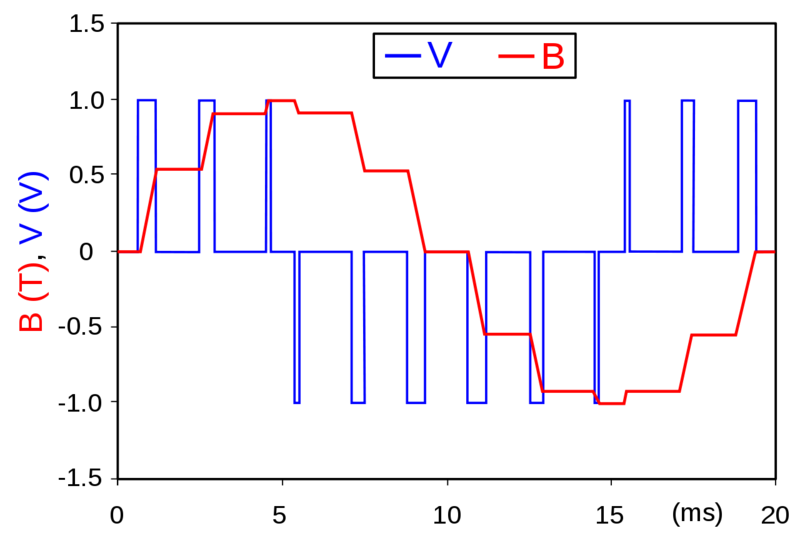 Actually, the peak-to-peak voltage is going to be close to 7.4 V. This is because the speaker is being used in a differential mode, connected to two separate MCU outputs, with neither terminal grounded. Since the firmware is simply driving the two pins with complementary waveforms, you can use just one of them (with a suitable filter, as JRE shows) to drive an external amplifier. Of course, the speaker will also get somewhat louder if you simply raise the supply voltage to the full 5.5V that the ATtiny85 allows. Note that the buffers are configured as emitter-followers. There's no voltage gain here (in fact, it loses about 1.3V in peak voltage), but a lot more current is available to the speaker. Since it's a digital signal, we don't need to worry about the horrible crossover distortion of this configuration. But it should be able to deliver about 4.8 VPP @ several hundred mA (1.7 VRMS @ 200 mARMS into 8 Ω), or about 360 mW of audio power! The site you got the circuit and code from tells you what it is doing. From the description, you can find out what the output looks like. It says it is using pulse width modulation (PWM) to generate the audio. Wikipedia has a good explanation of PWM, and how it is used to make audio. This image from the wikipedia page show pretty much what you can expect as output from your noise maker. The red line is what your speaker "sees." The blue line is what your circuit generates. Simply put, your program makes pulses of various widths on the two output pins. Wider pulses cause the speaker to move more than narrower pulses. The pulses have to occur faster than the speaker can respond to them. The inertia of the speaker smooths the pulses into something that resembles normal audio. What is limiting the volume of the output is the current from the output pins. That is normally measured in milliamperes. Assume you can get 20mA out of your pins. At 7 volts and 20mA, you will get maybe 0.14 watts. Assuming you don't kill your processor doing this. That's not much power. Compare it to what you expect from your stereo, and how many watts of power it can output. To get more power, the simplest thing to to is to clean up the PWM signal and send it to a regular amplifier. You only need one of the outputs pins. Your gadget uses two in attempt to get more power, but it really can't do much. Then connect the output to any standard audio amplifier. Buy and build a kit if you like, or connect it to the line in of a stereo. The pulse rate of the PWM will have to be much higher than 8kHz, so using a 4 kHz filter doesn't lose any of your audio, but should smooth the square edges into a nice smooth wave. There are small amplifiers that you could power from 3.3V. There are also many other amplifiers that run on higher voltages. 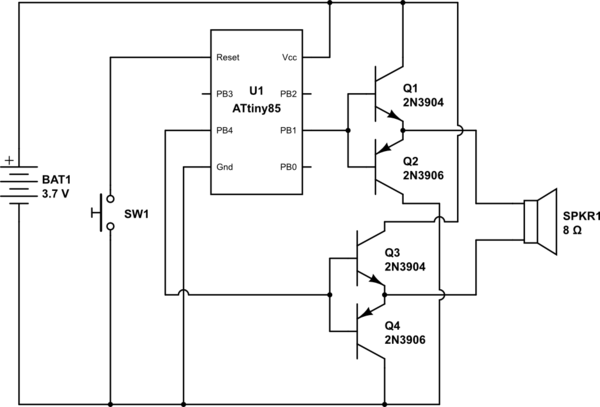 There are cheap and common circuits (and kits) to build an amplifier from an LM386. The LM386 needs 5V or more, though. It is commonly operated on a 9V battery. You could also look up H-bridges. If you drive an H-bridge with you speaker in the middle (the cross bar of the H) using your two processor outputs on the H-bridge inputs, then it should be quite loud. This could be tricky, though. It will be operating at the pulse rate, and amplifying the pulses rather than the smooth wave. That will cause a lot of electrical "noise" and probably make your speaker and the bridge get hot. Not the answer you're looking for? Browse other questions tagged microcontroller amplifier audio pwm attiny85 or ask your own question. Running the PAM8403 amplifier with only one audio channel?